Did you know that OpenStreetMap has a “Transport” layer for Lebanon? And that people have been adding bus routes to it by hand? “I moved to Lebanon in 2012. We did not intially have a car so we relied on public transportation. It was a bit frustrating at first because we did not know where the buses went etc. We eventually found the Zawarib book which has a Bus Map in the back. Unfortunately, the bus map only shows “areas” the buses goes to, which made it very difficult to know what street to go to catch a bus. Many times we waited on a street for a bus only to find out the bus actually goes down a parallel street. Or the apparent crossing of 3 routes in one place, but in reality 2 busses cross in one spot, and 2 others cross elsewhere. When I first discovered OSM in February 2014, I saw the transport layer had a good portion of routes tagged, but mostly on the West side of Beirut down to the airport and only LCC routes. I had become familiar with more of the east side routes, so I added them. Mostly 2, 7, 8, some OCFTC, Sakr. I can’t remember if I’ve tagged any of 9 or 15. I was quite glad to find OSM and added the routes (or partial routes) I knew. I joined OSM primarily so that I could have a good bus route map to reference that showed routes on actual streets. I am not using GPS, but just my memory from when I rode the bus routes. Initiatives like OSM, Zawarib and onlinelebanonbuses.com need constant maintenance to keep routes updated. Any grassroots mappers out there who can help? We are big fans of the فان رقم 4 Facebook page. With humor and one or two selfies, this page is humanizing a vital transport link between our capital’s centre and periphery. If mapping is about increasing familiarity, then it needs more than lines drawn on a 2D surface. For more poetic takes on the cultural side of transportation, see the full series here. Posted on July 15, 2015 December 5, 2016 Author BMP TeamCategories Updates, ViewsTags Advocacy, Lebanon, Public TransportLeave a comment on Why “Bus Map Project”? The same logic applies along Lebanon’s bus routes; informal ‘stops’ and ‘stations’ have developed near particular buildings, bridges and intersections. Do you know Al-Ittihad? El-Hayek? Kuwaiti Embassy? Gallery Semaan? 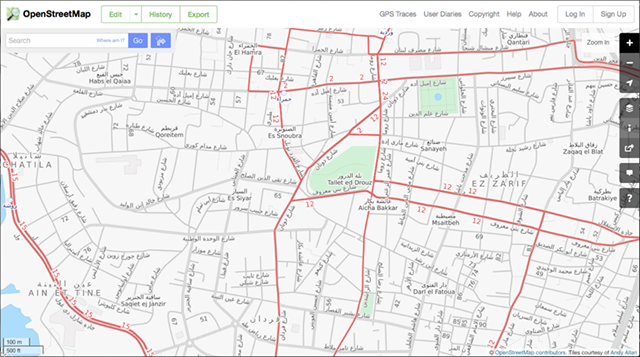 Posted on July 15, 2015 December 5, 2016 Author BMP TeamCategories ViewsTags Beirut, Culture, Design, Lebanon, Map, Navigation, Public Transport, User ExperienceLeave a comment on Mapping, Lebanon-style. . . So, Does Public Transport Really Exist? The following is adapted from a post by Bus Map Project co-founder Jad Baaklini, first published on his personal blog. It features research material produced by ODDD in the Maten. For a country that’s turned the word ‘philosophize’ into an insult (bala falsafeh ya zalameh), we sure do drift into weird ontologies, without even trying. What’s the difference between existing and not really existing? Can something actually exist but not really really exist? Infographic by ODDD+D16 (Courtesy of Eliesh SD). Click to enlarge. I mean, clearly something that looks like public transport exists. Mitsubishi Rosa, Nissan Civilian, Fargo/Abi Lama — these are actual vehicles that very real people board every day to actually get from point A to point B. They have particular owners and particular drivers, who are associated with specific license plates and driving permits. They gather in specific locations, which are part of complex and precise territorial arrangements that keep the tenuous peace between different fleets and route associations in this highly-competitive market. Fuel is consumed, money is made, and the public is transported from place to place. How can something so complicated be so easily dismissed? For many people, the interactions and exchanges that make up this system are invisible or obscured. They may see a bus pass by from time to time, but they can’t tell if its a private shuttle or a school bus, or where it might be heading. So when these people say that public transport doesn’t exist in Lebanon, they do so out of a lack of familiarity with how all these seemingly chaotic parts — this clustering around Cola, that bus making this cab driver curse, etc — fit together. This is understandable. If you’ve never heard of Beirut, would you consider moving there? The same goes for Beirut’s bus system: if you don’t know that 1000 LL (less that $1) can take you all the way from Hamra to Ain Saadeh via Bourj Hammoud — a distance of more than 15 kilometers — you could not possibly begin to consider alternatives to driving there yourself (if you have a car) or paying up to twenty times as much for a taxi. The problem of unfamiliarity is made more difficult by the fact that there are few tools or resources available to help potential bus passengers learn about these routes. Even when maps are made — and here is one attempt by Bus Map Project co-founder Chadi Faraj — there is still almost no dedicated road infrastructure to help you figure out where to catch these buses, on street level. It’s just something that — at the moment — you have to learn through trial and error, or by asking regular bus riders. Learning to navigate a city this way can be a little bit intimidating at first. Everything seems random, but once you start paying attention, you’ll very quickly see that these bus networks have many regularities and routines: you don’t have to constantly guess where the Number 5/8 bus passes through Mar Mkhael on its way from Hamra to Ain Saadeh, for example — it’s always the same place: Badawi Street. The bus then turns the corner onto Armenia Street, usually stopping at the traffic lights, before then heading over the Nahr Beirut bridge into Bourj Hammoud. There’s no visible ‘bus stop’ anywhere along this route, but the bus will stop for you if you’re waiting for it. Of course, not everyone is being literal when they say that public transport doesn’t actually exist. For these people, everything I just wrote is exactly why they believe that it doesn’t really exist — emphasis on “really.” This is because, according to their definition of public transport, what I described does not qualify. To them, a system that you have to “figure out” is no system at all, especially when its made up of a hodgepodge of gaudy bostas and second-hand minibuses imported from who-knows-where. To these detractors, what we have in Beirut is not “real” public transport for two simple and interrelated reasons: 1) “real” public transport must be publicly-owned (wen el dawleh? 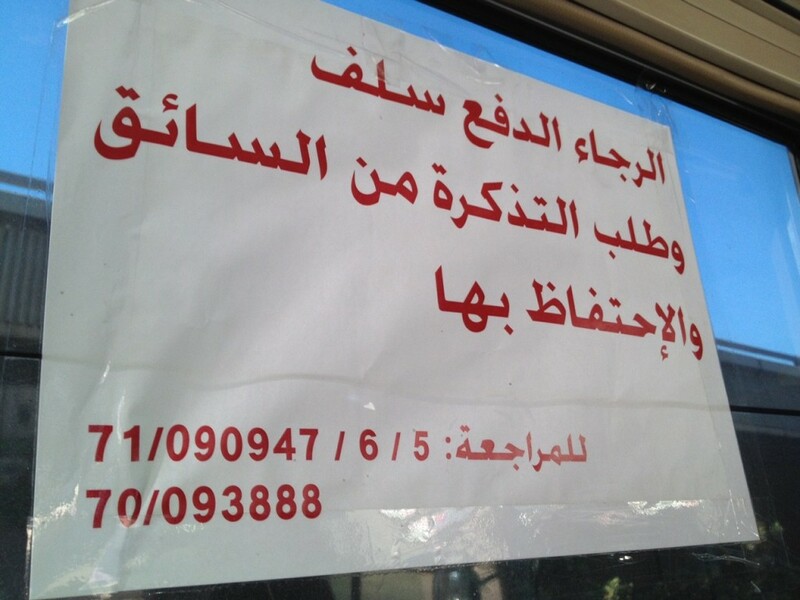 ), and 2) “real” public transport must look, feel and behave a certain way (mrattab, eben 3ayleh, etc). Let’s address these issues step by step. First of all, while state-owned bus routes do exist — that blue ticket above is from one of them — they certainly have their limitations. First, OCFTC bus fleets are very small, so trying to see one on the road can feel like being on safari. Second, their routes and designations overlap but don’t match with those of the larger and more popular, privately-owned fleets. 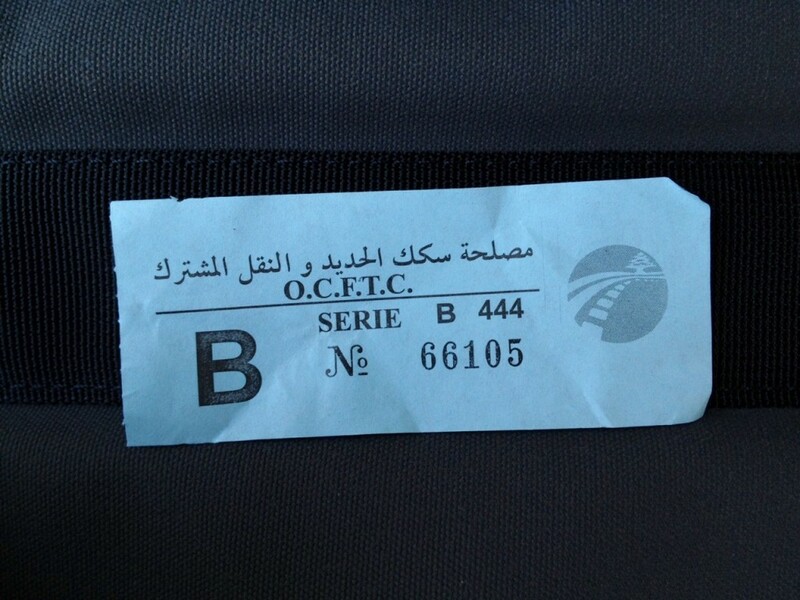 So a Number 5 OCFTC does not go the same place as the Number 5/8 I described above, even though you can see both on the Jdeideh-Fanar-Ain Saadeh section of that route (and let’s not start comparing these numbers to those of vans). More harmonization between the state- and privately-owned bus networks would obviously be much more helpful for all of us, but I wouldn’t hold my breath waiting. If we’re serious about breaking out of this scenario, we need to urge the state (and pro-transit activists) to avoid stoking these feelings of apprehension and mistrust by dismissing the existing transit system wholesale. 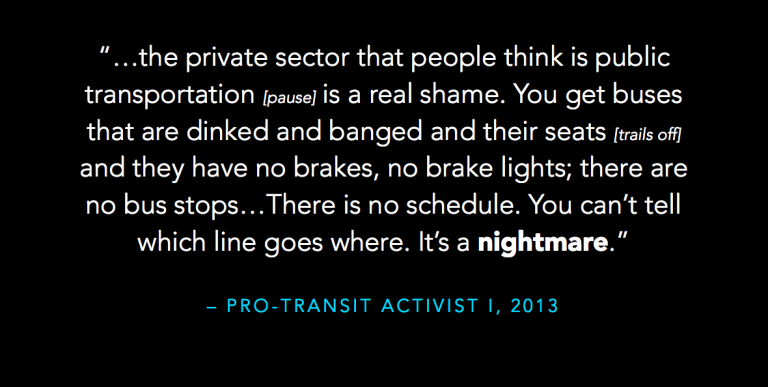 This leaves us with the issue of how public transport should look, feel and behave. Some people will admit that some kind of bus system exists in Lebanon, but will then rush to add: but it’s filthy and unreliable. For these people, public transport will only really exist when it starts to look like an image they have of Paris, London or NYC — images that are transformed in their minds and rhetoric into simplistic approximations of imagined machine-like efficiency that doesn’t really match the way transit actually functions in those cities. I don’t want to challenge these beliefs, and I certainly don’t want to romanticize the bus. There is certainly much room for improvement in the sector, most notably in the area of accessibility, as all buses currently available are not designed to accommodate wheelchair users, and pose a unique challenge to elderly passengers. While people who say that there are “no schedules” are exaggerating, the timeliness of buses can always be improved. But as a twitter friend once put it eloquently, the main question for people who want to see the system improved is: how can we dramatize the need for change without scaring people off from even trying what already exists? Do we have to dismiss the whole system to make a point? 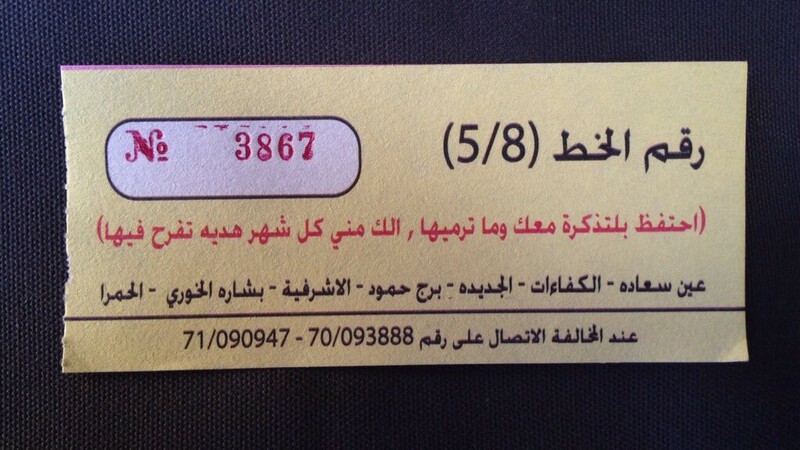 My response to those who say they’d love to ride public transport if only public transport existed in Lebanon is this: it does, wallah, it does — now go try it, and see if you can find a way to integrate it into your life. Posted on July 14, 2015 December 5, 2016 Author BMP TeamCategories ViewsTags Advocacy, Collaboration, Lebanon, Policy, Public Transport, Research1 Comment on So, Does Public Transport Really Exist?